The Mike Balter Chorale Series is a line of marimba mallets featuring extra long birch handles enabling the player to reach any interval. The heads are wrapped with microfiber, an extremely durable material, which is ideal for both indoor and outdoor playing. 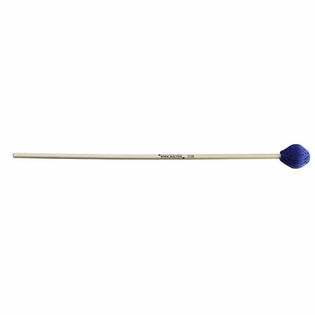 The Chorale Series Mallets produce a unique sound on both rosewood and synthetic marimba bars. The sound has the full-bodied warmth of a yarn covered mallet with the articulation of a mallet covered with cord. It is a logical choice for today's keyboard ensemble when you want each voice to be heard. I bought these mallets for the long handle because it's much easier to reach huge intervals when playing with cross grips that way. But I was really disappointed with the sound quality. This entire series of mallets is just way too articulate to give the marimba and kind of warmth. There is no difference between the medium hard and the hard mallets, and both are piercingly loud making them totally unsuitable for most marimba music. It sounded like I was hitting the keyboard with drumsticks. The bass mallets are okay. They're heavy and that lets you get more volume without sacrificing the softness as opposed to other bass mallets I've played with. But there wasn't a difference in hardness between the soft and extra softs. There's no graduation of hardnesses and the sound quality is incredibly poor. Good mallets in theory, but terrible in reality.